Kitchen Snaps: Baby Brussels Sprouts with Bacon, Craisins, Panko and Cheese - Last Minute Vegetable Idea! 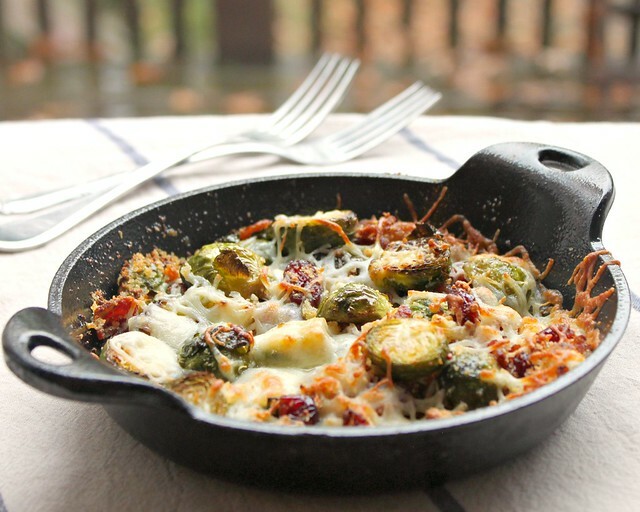 Baby Brussels Sprouts with Bacon, Craisins, Panko and Cheese - Last Minute Vegetable Idea! Top with a mixture of Parmesan, panko, goat cheese and mozzarella (or cheeses of your choice.) Lightly mix it all together in the pan to incorporate ingredients and then top with more cheese. Top with a few tiny dabs of butter if you wish (optional but nice). 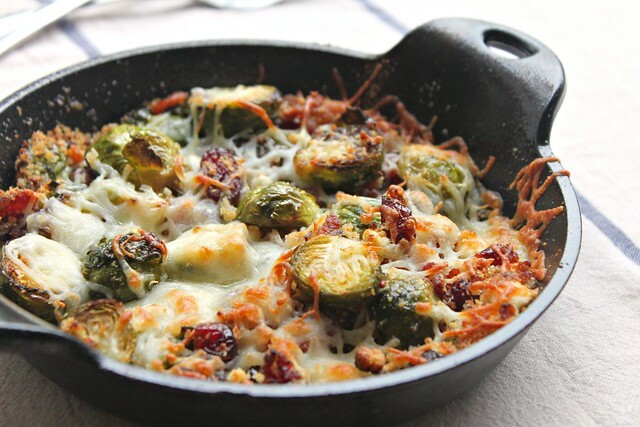 Bake in the oven 12-15 minutes or until cheese is melted and Brussels Sprouts are soft and caramelized. I like that cast iron skillet. Thisi sounds really good, everything goes better with bacon. Happy Thanksgiving! Ok, how is it that you can make me want to dig into a dish of Brussels sprouts?? 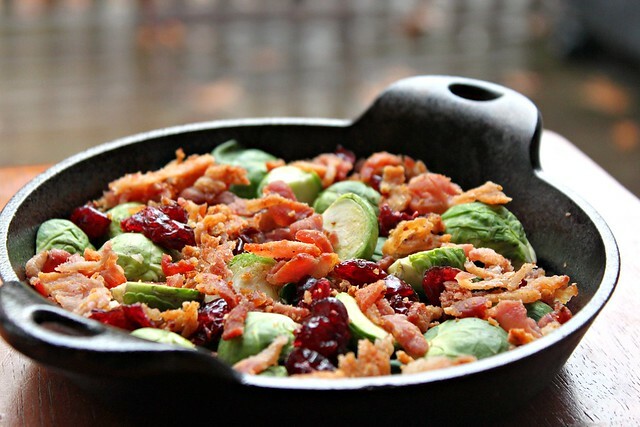 I hate Brussels sprouts... but oh my does that look amazing! I decided against brussels sprouts this year, but boy that looks good. I could always make it after Thanksgiving! Thanks guys! We're doing haricot vert for Thanksgiving, but we had some of these baby brussels the other night - THIS dish is what I came up with, with the the ones we didn't use. DEEEELISH and SIMPLE!!! I think lots of cheeses would work, I just used what I had on hand. Looks like we were both craving Brussel sprouts...have a Happy Thanksgiving. I live with a staunch sprout-hater, but this recipe sounds so wonderful that I just might have to try it anyways, in the hopes that it might actually change his mind. Love the addition of craisins, really! Yummylicious and not sinful! What a great twist. I must be crazy because I love brussels, but this takes them over the top! Happy Black Friday! Now this is the way to eat brussels sprouts. Delicious! And I think you've managed to make brussels sprouts that would please the masses. All those yummy additions sound perfect! This sounds so good..and looks so good too! I used to hate Brussels sprouts when I was little, but now I totally adore them. The dish looks extremely appetizing and I wish I had a bite! Just made this. I changed it up a little because I didn't have craisins so I used some red currant jelly that I had. I didn't have goat cheese which is disappointing cuz I know it would have really added to this. It was still awesome. My husband always says he hates brussels sprouts and he couldn't get enough of these (but then again everything is great with bacon and cheese on it)!